California recently took action to protect some of the state’s most threatened agricultural lands by investing in conservation easements and better land use planning. These tools have been used for many years by land trusts and local governments to permanently protect farmland from development. But for the first time the state is focusing its farmland conservation efforts to meet its climate change objectives. Under Governor Brown’s leadership, the Sustainable Agricultural Lands Conservation (SALC) Program was created with the first round of cap-and-trade revenue investments in FY 2014-15. SALC, implemented by the Strategic Growth Council in partnership with the Resources Agency, is the country’s first climate change and farmland conservation program aimed at reducing greenhouse gas emissions associated with sprawl development. At its June 30th meeting, the Strategic Growth Council approved 7 conservation easement projects covering a little over 14,000 acres for a total of $4.1 million. The Council also approved 5 Agricultural Land Strategies planning grants to support local governments in identifying critical agricultural lands at risk of development and to develop strategies to protect those lands. What’s the Climate Change Connection? 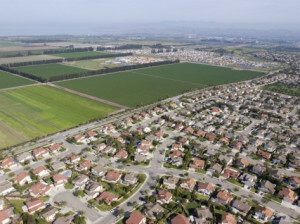 UC Davis researchers found that one acre of urban land emitted 70 times more greenhouse emissions compared to an acre of irrigated cropland. That number rises to 100 times more emissions when comparing urban land to rangeland. Sustainable farm management practices can further remove carbon from the atmosphere, thus enhancing the benefits of agricultural land conservation. Despite these benefits, California continues to lose farmland at alarming rates. Between 1984 and 2010 the state lost an average of over 50,000 acres of agricultural land annually. SALC’s potential to reduce greenhouse gas emissions is significant. Using the calculations from the UC Davis researchers for emissions from agricultural versus urban land uses, if SALC efforts reduce agricultural land conversion by 40% or 20,000 acres per year, it would avoid GHG emissions by 1.2 million metric tons, equivalent to taking 240,000 cars off the road and reducing vehicle miles traveled (VMTs) by 2.9 billion miles annually. The demand for SALC funding far exceeds the program’s current very modest funding of $5 million. The Governor has proposed $400 million in cap-and-trade funds for the Strategic Growth Council’s smart growth programs, including SALC. CalCAN and our allies have called for 10 percent of those funds or $40 million to go towards SALC in the coming year. The legislature and the Governor are expected to finalize the cap-and-trade expenditure plan for FY 2015-16 in the next month or so. Meanwhile, the Strategic Growth Council is hosting “Lessons Learned” workshops on their cap-and-trade programs on July 14th (Sacramento) and July 20th (Los Angeles). The Resources Agency will also host workshops on SALC program guidelines for the second year of funding later this summer (TBA).